"I do believe that the demand for satellite services and the corresponding need for satellites will continue to grow, and while it may never reach the heights projected in the late 1990s, it will certainly stabilize at a somewhat higher level than we've seen recently." 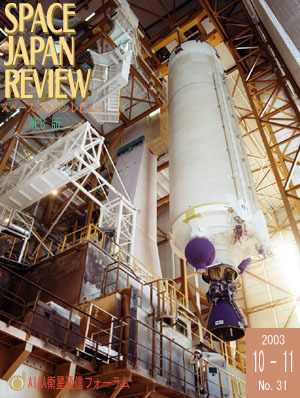 In the 21st AIAA International Communications Satellite Systems Conference, which was held in Pacifico Yokohama, Japan from 15 to 19 April 2003, Plenary Sessions A and B were held on 16 April. These sessions will be reported here. "Due to advance in space technology, small satellite may also have large capacity. It is possible to explore the advantages of observation, communications and global position systems." The results of the study is presented on the link budget calculation and the estimation of the signal transmission speed assuming multiband UWB signal transmission from a GSO satellite with 500MHz bandwidth. This article was reported in the 2003 Joint Conference on Satellite Communications (JC-SAT 2003) of IEICE of Japan in Octover 2003 at Tokyo. "Satellites are huge products created by many technicians and engineers in various fields and there are dreams and bright aspect in there whereas there are continuous and steady works varying from designing little substrates to satellite integration. I am fascinated to the feature of satellite business by such aspects." "On 30th October 2003 at 16:43 local time, ROCKOT launch vehicle soared into the sky from Plesetsk with "roaring sound" like its name in Russian lauguage. It has been 3 years and 5 months since our staff has visited this Plesetsk Cosmodrome for the first time for the preliminary survey as the potential launch service provider for USEF's SERVIS-1 satellite." (2)"Successful Launch of Horizons-1 JSAT / PanAmSat Joint Satellite Operation"
The 54th IAC(54th International Astonautical Congress : IAC2003) was hels in Bremen, Germany for six days during September 29 to October 3, 2003. The outline of this congress is presented. Dr. Minowa reports the sixteenth-annual Summer Session Program (SSP03) sponsored by the International Space University (ISU), which was held at the main campus of ISU in Strasbourg, France from 4 July to 8 October. Satellite Communications in the 21st Century: Trends and Technologies, edited by T. Iida, J. N. Pelton and E. Ashford. Review: This book describes not only the basic technology information on satellite communications system but also hot topics on the new technology and services such as advanced mobile satellite communication services and broadband Internet communications application. Furthermore, long-range perspectives covering next 30 years are discussed and analyzed and future promising satellite communications systems are proposed. Therefore this book is appropriate not only for the students and technicians learning satellite communications technology but also for the experts operating or developing satellite communications system.